Congratulations to Noah Bernardi of Northwood. Noah was named to the 2018 Fall Dean’s List at UConn. WHERE is the Big Woods of Northwood? WHAT conservation lands does it hold, and can you walk there without trespassing? WHY is Northwood at the headwaters of two major watersheds? WHO lives in the area, and goes on in the area? WHEN and HOW can you learn more? Come to the Northwood community center in the Narrows on February 27, at 6 p.m. to learn more! I can still be reached by phone at 603-736-7770. I’m serving on the Children and Family Law Committee and participating in the Children’s Caucus where I am helped by my years of clinical experience working with families in extreme circumstances. I am also closely following legislation related to DCYF prevention services, adequate school funding, the developing statewide addiction treatment system, the relocation of the Secure Psychiatric Unit at the state prison, and the creation of a statewide mental health reporting system for fair and accurate background checks when purchasing firearms. Please don’t hesitate to be in touch with your thoughts about bills and issues being considered by the Legislature. Thanks again to all the voters who put their trust in me to serve as your representative in Concord. On January 8th I attended the bond hearing for Northwood’s proposed public safety complex. I have said before there is a definite need for new space to house our police, fire and EMS departments. However, given our demographics, it has to be at both a reasonable and affordable cost. Unfortunately, the cost proposed at $6 million is more than double what several other communities our size have paid. This proposal cannot be considered best value for our taxpayers. With 625 seniors living in Northwood, many of whom are on a fixed income, their paying an additional several hundred dollars in property taxes every year for the next 20 years would be cost prohibitive. Since the advisory committee did not start meeting until October 29th I can understand why they were unable to complete a more thorough cost-effective analysis. Without the benefit of benchmarking, this proposal should not by supported by voters. Rather, the selectmen should expand the committee and require the committee to do their due diligence. Not comparing other communities our size and their cost and square footage is not due diligence. Also the committee cannot be in violation of the right-to-know law. A few weeks ago in a letter here I mentioned the new safety complex in Bow which is 24,000 square feet versus Northwood’s 16,000 (50% more than Northwood). Bow reduced their cost from $7 million to $4.3 (a reduction of 40%) after voters rejected it twice. Northwood’s proposed cost is 37% more than what Bow paid. The estimated household income in Bow for 2016 was $113,634 compared to Northwood’s at $71,220 or 60% higher than Northwood. As Patriots Coach Bill Belichick is fond of saying to his players – do your job. Selectmen and advisory committee members – do your job. 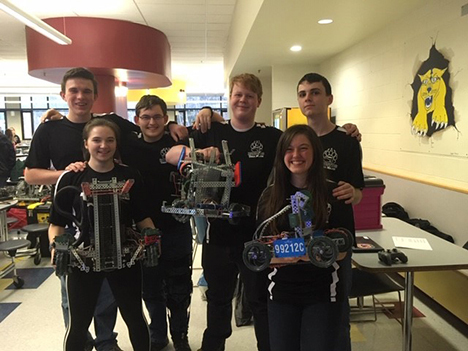 CBNA Robotics Team from left: Alasdair Morrison, Cordelia Norris, Noah Sinnamon, Nick Dyer, Emily Buehne, and Austin Carrier. On Saturday, January 19, CBNA’s Robotics teams, Ursa Major A, B, and C, competed against 42 other teams at ConVal Regional High School in the last tournament of the season. Competition was fierce as teams tried to secure a spot in the upcoming State Tournament. All three teams finished strong in the quarterfinals qualification rounds. Team members Austin Carrier and Emily Buehne had a 7th place finish heading into the quarterfinals. Noah Sinnamon and Nick Dyer finished 19th and Cordelia Norris and Alasdair Morrison finished 23rd. Emily and Austin then became Alliance Captains heading into the quarterfinals. Choosing Team C, Nick and Noah, for their alliance, the two teams faced off in the first elimination round against two Pinkerton Academy teams. After a solid win, Teams B and C advanced to Round Two of elimination where they were outscored by teams from Thetford, Vt.
All three teams had superb performances. Team C (Ruby Carr, Emily Buehne, and Austin Carrier) moved on to States. Team B (Noah Sinnamon and Nick Dyer) received the Judges’ Award. The pros for the new safety complex far outweigh the bad. I don’t believe there is a person in town who doesn’t believe this. It all comes down to dollars, and I, like everyone else, need all the dollars I can get, but now is the time to finally do this. Interest rates are at an all time low at 4%, our town has no debt and both of the buildings being replaced are shamefully inadequate, and in my opinion dangerous. The location chosen is perfect as we need to cover the east end of town. The Narrows station covers the west end, and the design of the building fits with town. The first payment would May of 2020 at $1.18 on our taxes. If your house is valued at $200,000 this would be $236 and would be $118 on your first bill and the same on your second, as we get two bills a year. The payment decreases over time. Also the price of the building has an $800,000 contingency for cost overruns, which if not used will be taken off the loan. Grants are also available. This safety complex will help to maintain our property values and keep our insurance rates in check. It will also increase our chances of bringing businesses into town which will increase our tax base, helping us all. Let’s all share this responsibility from start to finish and make this a point of pride for all of us. As with other areas in town, we’ve put this off as long as we can. Now is the time! Vote yes on the safety complex. If we get on a roll, maybe we could even replace the shrubs at the town hall. Celebrate The Academy Awards All Month Long On LRPA After Dark! Throughout February, Lakes Region Public Access Television will celebrate the Academy Awards with a month of Oscar®-nominated films. First up this weekend (February 1 & 2) is the musical comedy “Something to Sing About,” starring James Cagney, Evelyn Daw, Gene Lockhart and William Frawley. This film, made independently at Grand National Pictures, does not feature the spectacular production values of a studio like MGM. However, “Something to Sing About” was one of Cagney’s favorite films. He was particularly proud of the musical number that he danced with his vaudeville friends Johnny Boyle and Harland Dixon. “Something to Sing About” was nominated for Best Score. There were 14 nominees in this category, including such notable films as “Lost Horizon,” “Maytime,” “Snow White and the Seven Dwarfs,” and “One Hundred Men and a Girl,” which won the award. “Something to Sing About” offers a modern audience the chance to see a James Cagney movie that time has nearly forgotten, so what are you waiting for? Grab your popcorn and join LRPA after dark for this romantic musical from our long-lost past. It’s always good to start projects with good intentions. It’s just that good intentions are not enough.And six million plus dollars of good intentions is way too much. There is a proper debate going on as to whether we need a safety complex and just what it should be. Our own Northwood experience is one of spending even much smaller amounts of money without sufficient consideration. This will be, if it goes forward, the largest amount of money this town will have spent on anything and so it is critical that we gather all the good ideas that we can from the taxpayers of the community. This has begun to happen as I commented on at the public hearing before the select board. Clearly we need more ideas before we spend any more money. We have an opportunity, among other things, to learn from neighboring towns. Farmington was brought up at said meeting. None on the Select Board or subcommittee had even looked at it, among others. Being a curious fellow, I like to ask questions, I made arrangements to look at the Farmington safety complex and contacted others that might like to do so. It was last minute and only a few could go. It is an excellent example of a town that was on a very tight budget and got a great result. There are too many good points to make now but for 2.3 million dollars (turn key) they are by all accounts very happy. Lack of due process and thorough consideration has been a chronic problem in Northwood. We simply cannot afford to goof this up. Farmington, and numerous other towns, went through many go-rounds and several years to get a result that will serve them for many years in the future. I would also point out that bond interest rates are, for the moment, still at historically low levels. But the Federal Reserve Bank is planning 2 more hikes in 2019, so who knows how fast and how high they will rise. But rise they will. If not now, when? And if then, how much more? Tim Jandebeur has written to complain about the initial transparency of the process, and he makes a good point. But I just hope that, in the end, the legal fees don’t cost more than the building. The town owned a flat 88-acre parcel that required little site work. They borrowed heavily on Madbury’s complex plans and enjoyed some savings through a design/build approach. But most importantly, they did this five years ago, as the Great Recession had driven down construction costs and interest rates well below where they are today - and will be tomorrow. And where was Tim Jandebeur four years ago? As Chief Drolet advocated for this project even then, Selectman Jandebeur was busy sparring with the Catholic priest and School Board member Jandebeur was campaigning against full day kindergarten. Did you know that Fall is typically known as budget season? We’ve been working hard to prepare a responsible budget for the 2019-2020 school year. The Strategic Plan and School Board Goals were our guide throughout the budget process. We hope this information is helpful when you head to the voting booth. • School Board Goal states: Ensure the safety and security of pupils in the school. Northwood School received a $100,000 security enhancement grant from the state this year. We’ve proposed a warrant article to cover the remaining cost of construction and security upgrades to the school building. We’ve proposed an SRO (School Resource Officer). A Northwood Police Officer would be assigned to the school to provide a safe learning environment and protect all students. 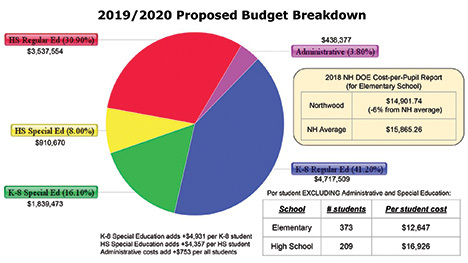 Northwood School would cover 80% of costs and the Town of Northwood would cover the remaining 20%. The officer will transition to the town for the summer months. • School Board Goal states: Prepare a responsible budget for 2019-2020 school year. • School Board Goal states: Establish and maintain staff/administrative consistency.